A stylish and contemporary four double bedroom family home occupying a generous South Westerly aspect garden plot situated on the outskirts of the village. The well presented accommodation benefits from a versatile layout having three separate reception rooms, in addition to the generous open plan kitchen/dining room which has bi-folding doors opening onto the patio. A useful utility room and cloakroom completes the ground floor. On the first floor there are four bedrooms generous double bedrooms and a family bathroom, three bedrooms have built in wardrobes and the two largest rooms feature contemporary en-suite shower rooms. The high specification of this property includes; zoned under floor heating throughout the ground floor and a solar assisted hot water system, top quality 'Siemens' kitchen appliances, and 'Villeroy and Boch' sanitary ware with chrome 'Hansgrohe' fittings. We highly recommend arranging a viewing to fully appreciate this quality home. From our office turn right into the High Street towards Guildford continuing straight over two mini roundabouts and taking the second exit at the next roundabout signposted to Guildford. Continue down this road for approximately 1 mile and the property will be found on the left hand side. 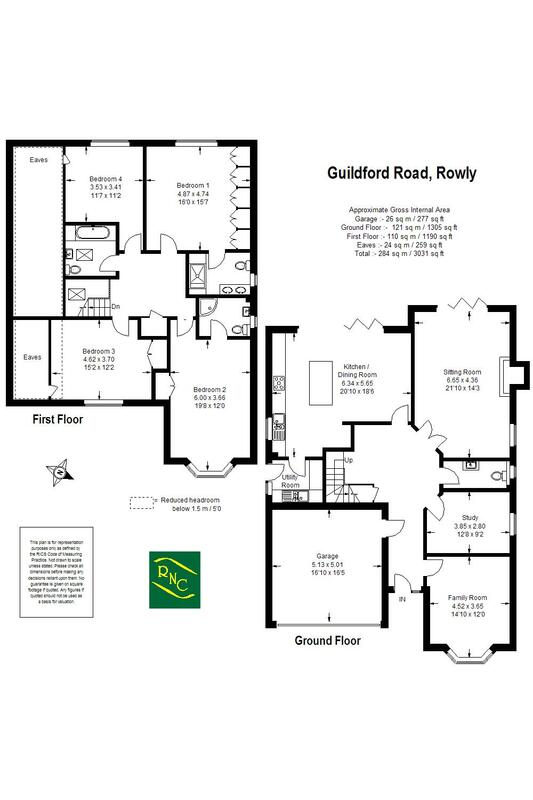 The property is situated on the edge of Cranleigh village which is a large, attractive and vibrant village on the edge of the beautiful Surrey Hills, midway between Guildford and Horsham. It has a fantastic mix of shops, pubs, restaurants and cafes, from independent retailers to well known brands including M&S Food Hall and Sainsburys, as well as a weekly market. The village boasts a huge array of clubs and societies to suit many tastes as well as a leisure centre, arts centre, library, children's playgrounds, a choice of golf courses and a number of churches. Cranleigh is popular with families, with an excellent range of nurseries and well regarded private and state schools. The nearby towns of Guildford, Godalming and Horsham offer mainline train services to London. Tiled floor, understairs storage cupboard. Contemporary 'Villeroy and Boch' suite comprising wash hand basin and concealed cistern WC, part tiled walls and floor. Bay window, front aspect, selection of bespoke fitted cupboards and shelves. Feature fireplace with stone surround and granite hearth, solid fuel burning stove, Bi-folding doors opening onto rear patio. Selection of base and wall mounted units, stainless steel sink with mixer tap, space and plumbing for washing machine and tumble drier, barn style back door. Velux window, large boarded loft accessed via ladder. Linen cupboard housing hot water cylinder with solar assistance. Double bedroom, featuring a generous selection of fitted wardrobe cupboards. Rear aspect. Contemporary 'Villeroy and Boch' suite with 'Hansgrohe' fittings comprising fully tiled walk-in shower enclosure thermostatic shower, tiled vanity unit with 'His and Hers' wash hand basins, close coupled WC, wall mounted mirrored storage cupboards, chrome heated towel rail. Spacious double bedroom, bay window with front aspect, built-in double wardrobe cupboard. Contemporary 'Villeroy and Boch' suite with 'Hansgrohe' fittings comprising fully tiled shower enclosure with thermostatic shower, glass sliding door, close coupled WC and wash hand basin with mixer tap and storage drawer under, part tiled walls and tiled floor, chrome heated towel rail. Spacious double bedroom, built-in double wardrobe cupboard, further eaves storage cupboard, front aspect. Double bedroom, eaves storage cupboard, rear aspect. Contemporary Villeroy and Boch white suite with comprising bath with mixer tap and shower attachment over with glass and chrome shower screen, wash hand basin with mixer tap and storage drawer under, close coupled WC, part tiled walls to wet areas, chrome heated towel rail. The property is approached via a gravelled driveway which proceeds through the five bar gate into a parking area for several vehicles leading to double garage. Access to side of the property leads to the fantastic rear garden with the total plot measuring approximately ¼ of an acre in size and benefitting from a South Westerly rear aspect with mature hedge and close board fencing boundaries. Furthermore there is a generous area of paved patio with brick edging providing a lovely outside entertaining area. Electronically operated up and over door, power and light points, wall mounted gas fired boiler for heating and hot water.